As I write this, I am still recovering from quite the whirlwind of a weekend! 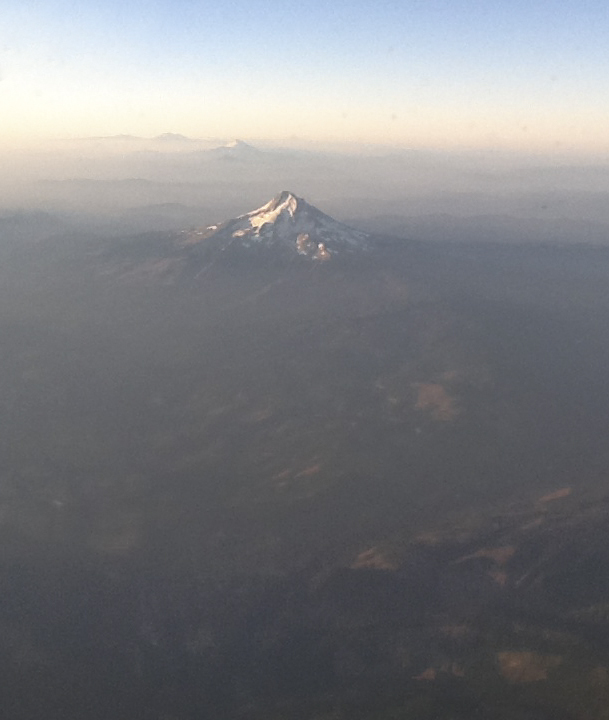 I flew out to the West Coast on Friday night, and returned to the East Coast on Sunday. I met SO many people who are not only leaders in the technical communications field in one capacity or another, but they are also nice and SMART people in the field. You couldn’t help but be inspired or feel smarter once you walked out! Now granted, this was the first time I ever attended a conference-type event within the tech comm field, so I was excited to be there and soak everything in as much as I could. This is not to say that I’ve never been to a professional conference or travelled to this type of event; I just never have done it with the tech comm crowd. Like I said, for me, at least, as the “new kid on the block”, I didn’t know exactly what to expect of the event, the topics, or the people I would encounter, and I’m glad to say that everyone was very welcoming to me, and I felt included as a fellow technical communicator very quickly. It was a little surreal in some instances, because many of the people I met were those whom I had only met online through Twitter or Facebook–Twitter mostly, so to be among such a collection of established tech comm thought leaders could have been a lot more intimidating, but it was not that way at all. There was so much great information that came out from the morning that I will be splitting up my report over the next few days. Each day going forward will have my summary about each speaker at the event. And I have some photos as well! So, let me get started into the Adobe Day event itself –with some photos! Saibal Bhattacharjee (@saibalb79) from Adobe setting up. 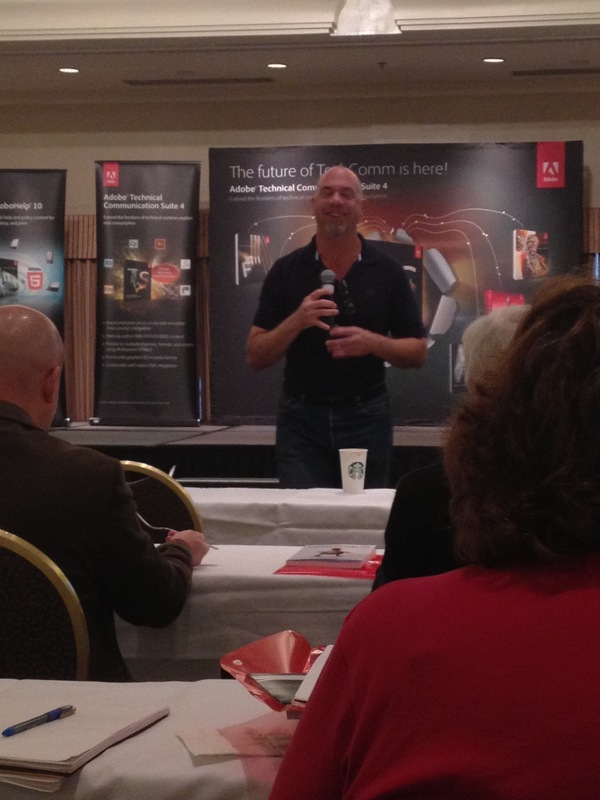 The Adobe Day event started with an introduction from LavaCon organizer Jack Molisani welcoming everyone to the event. 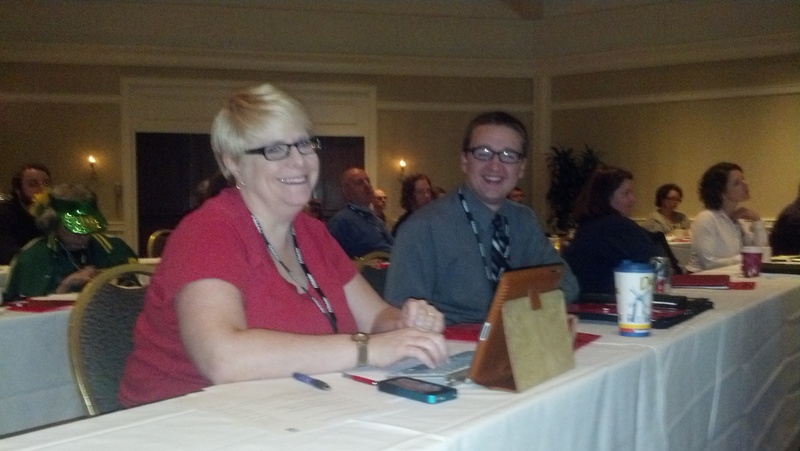 Jack, thanks for organizing and running LavaCon! Although I’m missing the main conference, I’m hearing awesome stuff about the speakers on Twitter, so I think you deserve some kudos for helping to assemble all of it! Jack was followed by a short introduction and welcome by Maxwell Hoffmann, who is one of the key players of Adobe’s Technical Communications marketing team. If you’ve ever attended any Adobe Tech Comm webinars, more than likely you’ve heard Maxwell moderating the webinars. He is also one of the bloggers for Adobe’s Tech Comm blog. Having worked with him while creating my own webinar for Adobe, I can say that he does a fantastic job at what he does. One thing I’d like to mention, before continuing, is that the nice thing about Adobe Day was that is wasn’t actually about Adobe or promoting Adobe products. I don’t recall during the entire duration that any speaker promoted any Adobe product or the brand other than possibly to thank the company for the opportunity to speak. All the speakers spoke broadly about technical communications as a whole, so whether one supported Adobe products or not, everyone could benefit from the information being provided. This really was a collective presentation of the best and brightest in thought leadership, and an opportunity to network and learn from those who are considered top in the technical communications field. Now, for this post, I’m actually going to start this Adobe Day series going backwards in the day’s event, starting with the panel discussion that was at the end of the morning. The panel topic at the end of the Adobe Day event was titled, “The Decade Ahead: Opportunities and Challenges for Technical Communications Professionals.” Scott Abel, who is also known as “The Content Wrangler,” moderated the panel. 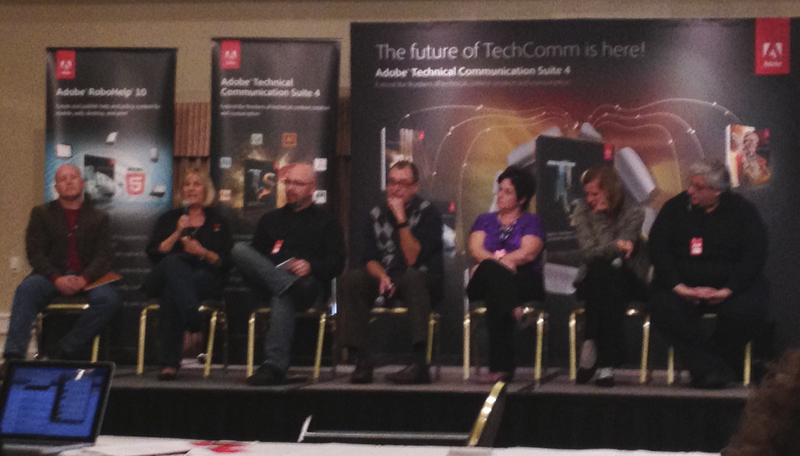 The panel included several of the leading thought leaders in the tech comm industry. The panel consisted of Joe Gollner, Beth Gerber, Bernard Aschwanden, Joe Welinske, Val Swisher, Sharon Burton and Joe Ganci. As far as the opportunities in tech comm right now, Sharon Burton said it best when she exclaimed, “We are in the Wild West!” meaning that the field is still so very wide open that anything done right now would be in the pioneering spirit. Another point that Sharon summarized was that 99% of the content consumers are not happy with the tech comm content they are receiving, and so a revolution is brewing. It was agreed by all that so many new ways to deliver content are out, such as using audio, video, shared content, personalized content and mobile content. The choices are limitless and there is so much to explore that there is room so that we can all contribute! Interactivity and structured content will be key to communicating information as well. That said, the group presented the challenges ahead, which included providing technical communicators with an education on understanding all the available possibilities, combating management’s misperception of cost, the general resistance to progressive change, business models still tied to old metrics, and too many tech comm specialists instead of tech comm generalists. An additional challenge mentioned dealt with the relationship that technical communicators have among themselves as well as to the rest of the world. It was suggested that technical communicators are not creating appropriate relationships with other business departments, and need to be proactive in business affairs to prove the value of tech comm as a whole and how it integrates with other business needs, thus providing a good ROI (return on investment). When the panelists were asked what skills were needed to go forward, they replied that the need to create communities to support each other and learn from each other was key, which could be done through such activities like participation in branding and discussion on the Twitter website with other technical communicators. Bernard Aschwanden did comment, “People are not lazy enough!” which elicited a laugh. However, his point was that in this day and age, people just want more direct route to complete tasks, and community building was part of that. Nolwenn Kerzreho, another attendee at Adobe Day, noted on Twitter during the discussion that “[T]ech writers need to change, have to get an education in structured writing and writing for a global audience…Key is that needs to be promoted…everywhere!” Good point that I missed noting on Twitter myself, Nolwenn! In other words, the panel felt that while this is a time with a lot of changes due to technological advances with plenty of opportunity to use different kinds of content to deliver information, there are still obstacles in the way that prevent those opportunities from coming to fruition. However, those obstacles aren’t anything that can’t be conquered over time. 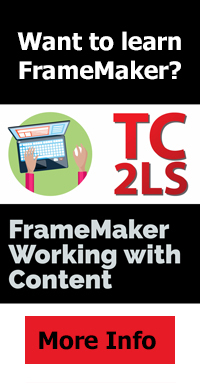 A big part of making these opportunities happen will be adopting the use of structured content and community building. Now, if this was the caliber of the discussion just for the panel at the end of the Adobe Day event, then you can only imagine that each of the presentations before this were equally great as well, and why I’ve come back with renewed enthusiasm. I’ll also just add here that I had the chance to meet SO people that I had only met through social media or featured in various technical communications media. It was like a parade of tech comm stars to me, and I was a little in awe to be among them! I enjoyed meeting so many people who really enjoy what they are doing and trying to make a difference in this field. 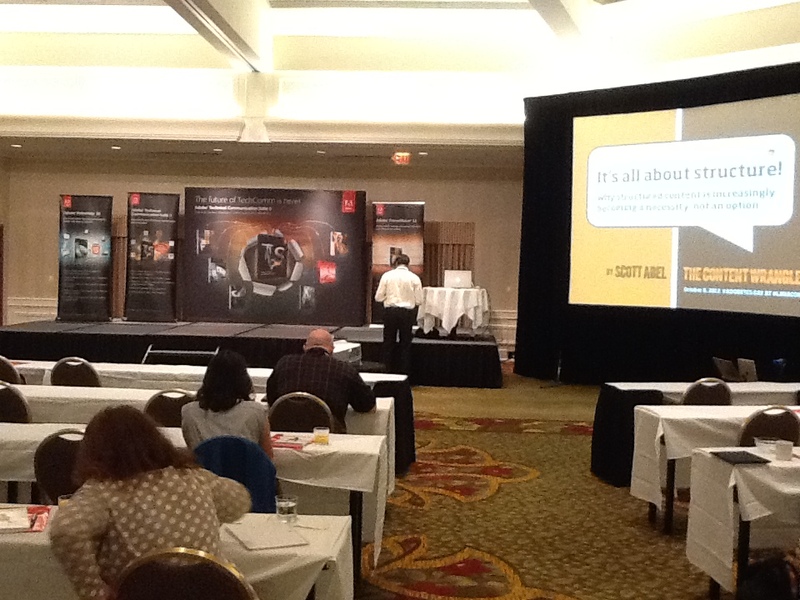 Waiting for Adobe Day to start! I also have to say that in addition to Maxwell Hoffmann, I met others from the Adobe team as well, including Saibal Bhattacharjee, Ankur Jain (the Robo(Help) Cop!) and Tom Aldous. They did an excellent job putting this event together, and I appreciated their kindness and support in having me there to attend. I felt so welcomed! I was really happy to meet them in person after so many months of corresponding through Twitter or email. I’ll be going through each presentation given prior to this panel in the next several posts over the next week, and I know you will find the information as educational as I did. 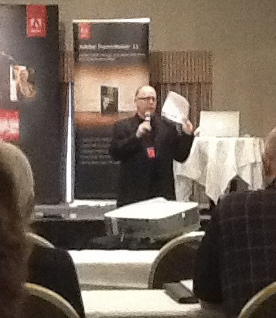 Next post: Adobe Day Presentations: Part I – Scott Abel and Structured Content. This entry was posted in Uncategorized and tagged Adobe, Adobe Day, Adobe FrameMaker, Adobe RoboHelp, adobe technical communications, Adobe Technical Communications Suite, digital literacy, Facebook, Framemaker, iPad, Lavacon, mobile, professional conference, RoboHelp, single sourcing, singular experience, social media, social media community, structured content, structured writing, tech comm, tech comm software, TechCommGeekMom, Technical communication, technical writing, translation, Twitter, video. Bookmark the permalink.